At SIGGRAPH 2017, X-Rite will demonstrate how Maxwell users can visualize their creations using physically correct digital materials. Maxwell Render has the most physically correct algorithms in the market using a photographic approach to rendering. Through the TAC ecosystem and AxF, users obtain the perfect combination for accurate and realistic visual representation. X-Rite Incorporated, a global leader in color science and technology, and its subsidiary Pantone LLC, today announced that Next Limit Technologies Maxwell 4.1 natively supports the Appearance Exchange Format (AxF™). Developed by X-Rite, AxF is a vendor-neutral format that enables the communication of all aspects of a physical material’s appearance – color, texture, gloss, refraction, transparency, translucency, special effects (sparkles) and reflection properties – in a single, editable file to improve design virtualization. AxF allows Maxwell users to load physically accurate digital material files and convert them to Maxwell materials for a consistent look across platforms. X-Rite and Next Limit will showcase the AxF integration at SIGGRAPH 2017, July 30 – August 3 in Los Angeles. AxF is the foundational component of the X-Rite Total Appearance Capture (TAC™) ecosystem, a solution that brings a new level of accuracy and efficiency to the capture, communication and presentation of physical materials in the virtual world. Traditionally, the capture and rendering of complex materials such as special effects paints, meshes and synthetic fabrics have been a time-consuming and manual process. TAC addresses this challenge with a new level of precision in material scanning coupled with an ability to share the resulting data, via AxF, across an expanding set of rendering tools such as Maxwell. “Maxwell Render has the most physically correct algorithms in the market using a photographic approach to rendering. Through the TAC ecosystem and AxF, users obtain the perfect combination for accurate and realistic visual representation”, said Victor González, CEO, Next Limit Technologies. Maxwell™ is a high-fidelity rendering software for visualization markets. The latest Maxwell 4.1 is up to 8X faster, as it brings a lot of new capabilities such as a Denoiser feature, optimized GPU support, Multilight™ standalone tool, and more. Now you can also load X-Rite’s Appearance Exchange Format (AxF) files to get a great looking conversion to Maxwell materials, so you get a consistent look of your materials across platforms. AxF is a binary digital file format and is not restricted to a specific device or measurement geometry, spanning single spectrum to full BSSRDF. It is designed to compress raw data from terabytes to megabytes providing third party software applications, such as Maxwell, with efficient access to a full set of material appearance characteristics without compromising performance. SIGGRAPH 2017 attendees can see a demonstration of X-Rite’s award-winning Total Appearance Capture (TAC) ecosystem and the AxF integration with Maxwell at the X-Rite booth 1104. Attendees will see how AxF files can be used within the Maxwell software and applied to rendering and animation. The TAC ecosystem is comprised of the TAC7 scanner, PANTORA™ Material Hub desktop application, and Virtual Light Booth (VLB). Physical material samples are scanned using the TAC7 scanner, which captures appearance properties digitally to create AxF files that store appearance data. The files are stored, managed, viewed and edited in the PANTORA desktop application. The AxF files can be shared with Product Lifecycle Management (PLM), Computer-Aided Design (CAD), and state-of-the art rendering applications including Allegorithmic Substance Designer, AMD Radeon™ ProRender, Autodesk VRED™ Professional 2017, Lumiscaphe Patchwork 3D, Luxion KeyShot® Next Limit Maxwell, and NVIDIA Iray®. The Virtual Light Booth is the industry’s first immersive 3D visualization environment for evaluating material appearance. It allows users to accurately and efficiently visualize and compare 3D digital material renderings side-by-side with physical samples. 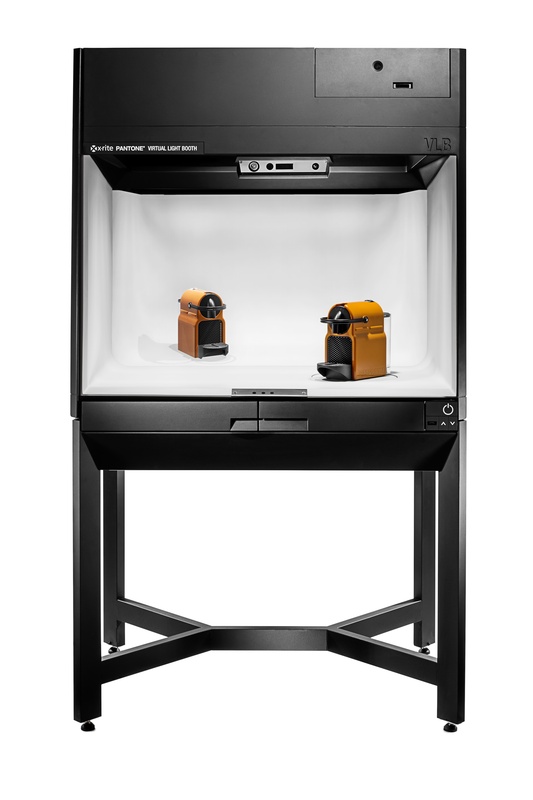 The VLB combines X-Rite’s SpectraLight QC professional light booth technology with a high-brightness, color-calibrated LCD display, color management technology, and motion tracking sensors. This allows the VLB viewing environment to control parameters that influence the perception of appearance from illumination to contextual to observational factors. With the VLB, design teams can easily vary these conditions to see changes in material performance. This helps ensure consistency between digital prototypes and final physical products and empowers designers to make more informed material selection decisions reducing approval cycles and accelerating time to market. Founded in 1958, X-Rite Incorporated is a global leader in the science and technology of color and appearance. With its wholly owned subsidiary Pantone, X-Rite employs more than 800 people in 11 countries. The company’s corporate headquarters are located in Grand Rapids, Mich., with regional headquarters in Europe and Asia and service centers across Europe, the Middle East, Asia, and the Americas. X-Rite Pantone offers a full range of solutions used by manufacturers, retailers, printers, photographers and graphic design houses to achieve precise management and communication of color and appearance throughout their processes. X-Rite Pantone products and services are recognized standards in the printing, packaging, photography, graphic design, video, automotive, paints, plastics, textiles and medical industries. For further information, please visit http://www.xrite.com.